Celebrate Easter with family and friends at one of downtown Evanston's fabulous restaurants! Enjoy a wonderful gathering without all the work! Plus, fill up those Easter baskets with goodies from our local shops listed after the brunch options. The Barn has you covered for Easter Brunch with a "mini" bread basket, challah french toast, steak & eggs, eggs benedict, Barn chopped salad, mac n cheese and more! Open from 10:30am to 2:00pm. Click below to make a reservation or call 847-868-0481. Celtic Knot Public House | 626 Church St. Celebrate with Celtic Knot all week! Special menu items served from 4 to 9pm Sunday through Thursday, 4pm to 10pm on Friday and Saturday and all day (11am to 9pm) on Easter Sunday! Reservations recommended by calling 847-864-1679. Click below to see the menu items. Chef's Station | 915 Davis St. Chef's Station is celebrating Easter with a 3-course brunch menu with your choice of appetizer, entree and dessert. Brunch will be available from 10am to 4pm and the price is $45/person. The regular dinner menu will be available from 4pm to 7pm. Call 847-570-9821 to make a reservation. Celebrate with Cupitol from 8-3PM (be closing early today) with their delicious pancakes, omelets, and pastries. And they're giving away a free stack of pancakes with every mimosa purchase. PS: Want to enjoy Cupitol at home with your crew? Contact us for Easter catering options. 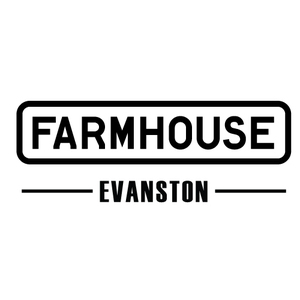 Farmhouse Evanston | 703 Church St.
Join Farmhouse for an all-day Easter buffet! Serving a brunch buffet from 9am to 2pm and heartier dinner items until 7pm. A la carte breakfast is available 7am to 8:30am and a la carte tavern menu is available 7 to 10pm. $38 for adults and $16 for kids during brunch (9am-2pm). $42 for adults and $18 for kids during dinner (2pm to 7pm). Reserve a table at 847-492-9700. Found Kitchen | 1631 Chicago Ave.
Found is hosting an Easter brunch buffet from 10:30am to 2:00pm. $39 per person, $18 per kids under 12 and complimentary for kids 5 and under. Beverages, tax and tip not included. Click on link below to make a reservation. Hearth Restaurant | 1625 Hinman Ave.
Join Hearth Restaurant this Easter for a special Easter Brunch with specialties like shakshuka, carrot cake pancakes and marinated lamp there is something for everyones taste buds. Easter brunch is available from 10:30am to 6pm. Children's menu available. Koi Fine Asian Cuisine & Lounge | 624 Davis St.
Koi has a special Easter Weekend Dim Sum Brunch with over 30 small plates and bottomless Bloody Marys and Mimosas! Brunch is on Saturday and Sunday from 11:30am to 3:00pm. Next of Kin Restaurant & Cafe | 625 Davis St.
Pete Miller's | 1557 Sherman Ave.
Prairie Moon | 1635 Sherman Ave. Celebrate Easter at Prairie Moon's brunch buffet featuring more than 30 items, sweet and savory. $26.95 per person (includes a brunch cocktail or beverage). Children under 10 are half-price and children under 3 are free. Click below to see the full menu. Terra & Vine | 1701 Maple Ave.
Terra & Vine has a special 3-course prix fixe brunch menu for $34 and $12 Children’s menu. Note that hte regular brunch menu will not be available. Click below to view the menu. Patisserie Coralie | 600 Davis St.
Add a very special treat to your Easter celebration! Patisserie Coralie is offering a Spiced Carrot Mango Cake with carrot and ginger mousse, carrot mango confit, coconut gaconde, pecan streusel, and chocolate decor. $23 serves 4-6 people and $29 serves 6-8 people. Please email fiona@bestfrenchpastries.com by April 18 to reserve your cake! Kilwin's Evanston | 1724 Sherman Ave.
Kilwin's has the most adorable chocolates and other decorated treats to fill up your kids Easter baskets!